The McDavid Studio was transformed into the 1695 Mexico City convent of San Jerónimo on (Easter) Sunday afternoon for the professional premiere of David Crozier’s (composer) and Peter M. Krask’s (librettist) chamber opera, With Blood, With Ink. 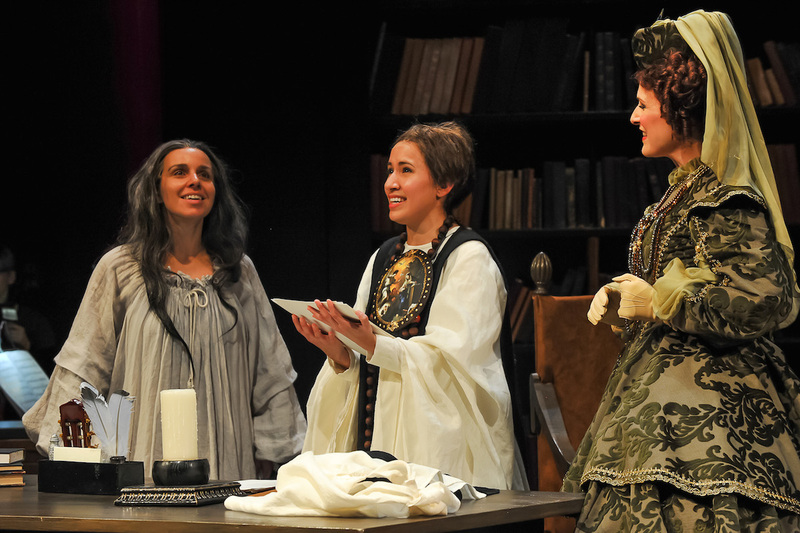 The opera features the story of 17th-century Mexican poet, and women’s rights champion, Sor Juana Inés de la Cruz. Presented in nine scenes introduced by fragments of a Requiem Mass by antiphonal choristers, the work makes use of chant, and creates themes and motifs from the familiar melodies of the Dies Irae, Kyrie eleison and Sanctus; giving the “new” work an appropriately “old world” feel. Though it seems almost farcical for a work about a Mexican set in Mexico to be in sung in English, one of the main goals of the work as stated by the composer and librettist, is to introduce this figure to the English speaking world. Sor Juana Inés de la Cruz’s story is certainly a compelling one. An orphaned girl who became an intellectual prodigy, Sor Juana Inés de la Cruz, was taken into the viceregal palace of Mexico before joining a convent in order to continue her education, as it was the only way for a woman of the time to become learned. Her poetry was published by her contacts at the Mexican royal court and, once the focus of those poems began insisting on women’s rights for education, the Church and her convent turned against her, forcing her to renounce her writings and take a vow of intellectual silence (signed in her own blood) in order to continue living as a nun. She died just two years after her silencing. Crozier & Krask present the work from the point of view of Sor Juana on her deathbed, looking back at key moments of her youth. Throughout these scenes, The dying Sor Juana follows her younger self around the stage, while intermittently interacting and reacting to these moments being played back in front of her. Soprano, Vanessa Becerra, in her official Fort Worth Opera debut performed the role of The Young Juana fabulously, and soprano Sandra Lopez gave a moving performance as the Dying Sor Juana. Once again, Fort Worth audiences are privileged to experience professional premieres of works of this magnitude alongside mainstage repertoire. It’s the operas like With Blood, With Ink that help to give the Fort Worth Opera Festival a truly “festival” feel, rather than simply a condensed season.